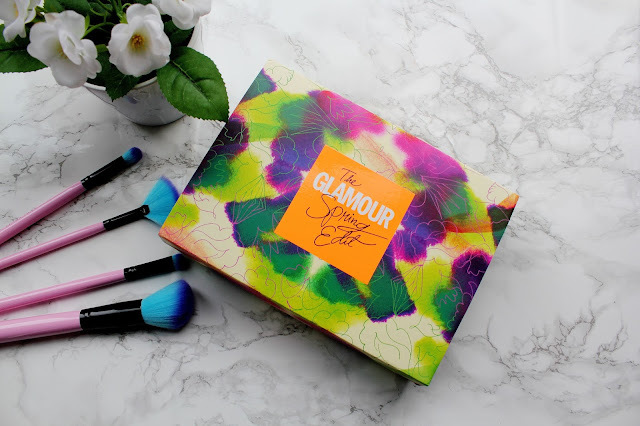 Every beauty box that Glamour Magazine has launched has been really popular and a quick sell out. 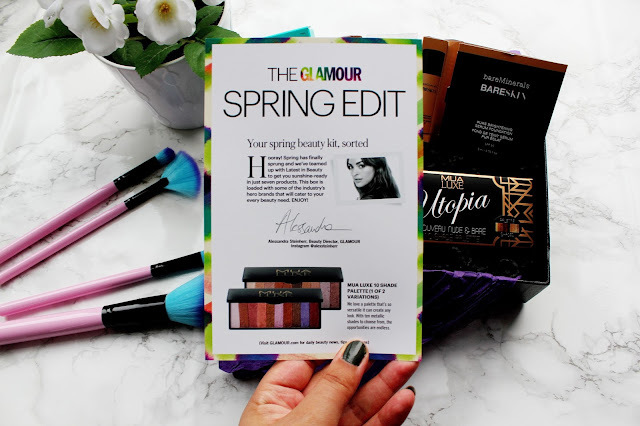 The latest beauty box the 'Glamour Spring Edit' was released only a few days ago and I've been seeing it everywhere online. I think this box is a real stand out from the other beauty boxes around at the moment as the boxes come out only a couple of times a year and they are handpicked by Glamour magazines beauty director, Alessandra Steinherr. It's only £17.99 and it's available via Latest In Beauty. 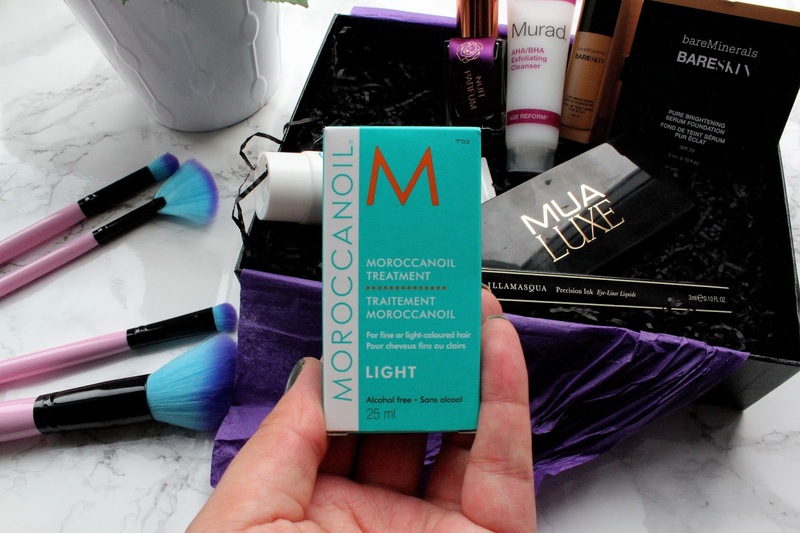 MoroccanOil Treatment I absolutely love this oil. I've gone through about 3 of these and I'm so glad I've got another one in my life as I've run out. I love using this on the ends of my hair when it needs some more TLC (especially when I've just come out the shower) and it works so well with my hair. Rosie for Autograph Nuit Parfum Rosie Huntingdon Whiteley's range for Marks and Spencer is all over the blogosphere right now. I absolutely love the bits from the collection which I own (you can check out the blog post here) and I think this range is amazing. 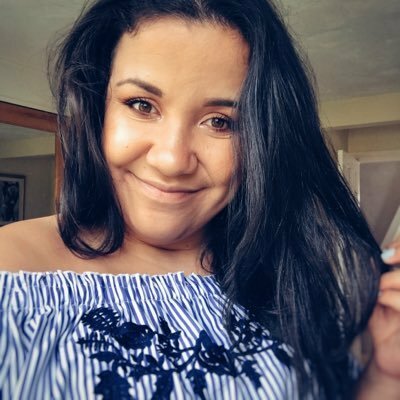 I can't wait to pick up some more pieces from this range. 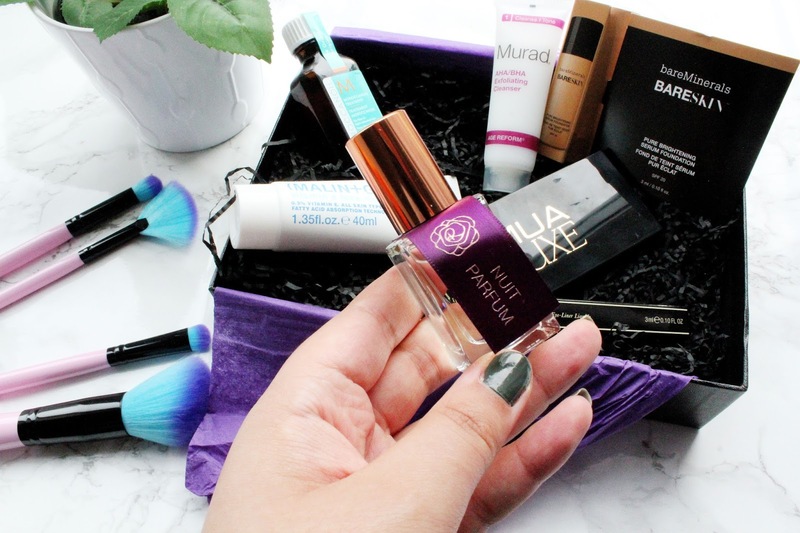 Who doesn't want a perfume which leaves you smelling like a supermodel?! This perfume has notes of Jasmine and Rose and it's currently living in my handbag as I love it so much. 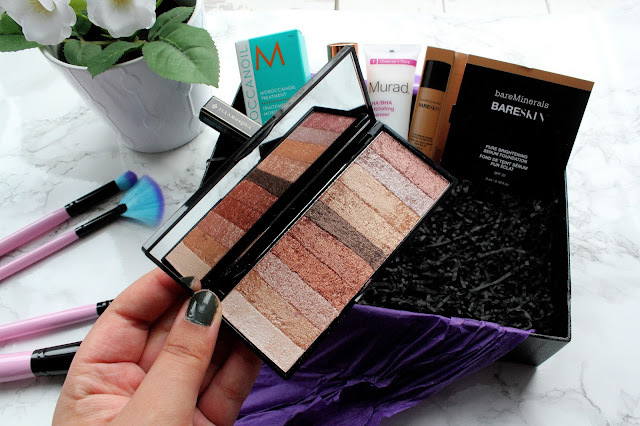 Bare Minerals BareSkin Brightening Foundation SPF20 I've come to love Bare Minerals over the past few months. My favourite product from them which I've tried is the complexion rescue and it's such a hydrating tinted moisturiser. I really wanted to try out this foundation when I first saw it on a blog (I can't remember who's!) but it looked amazing. 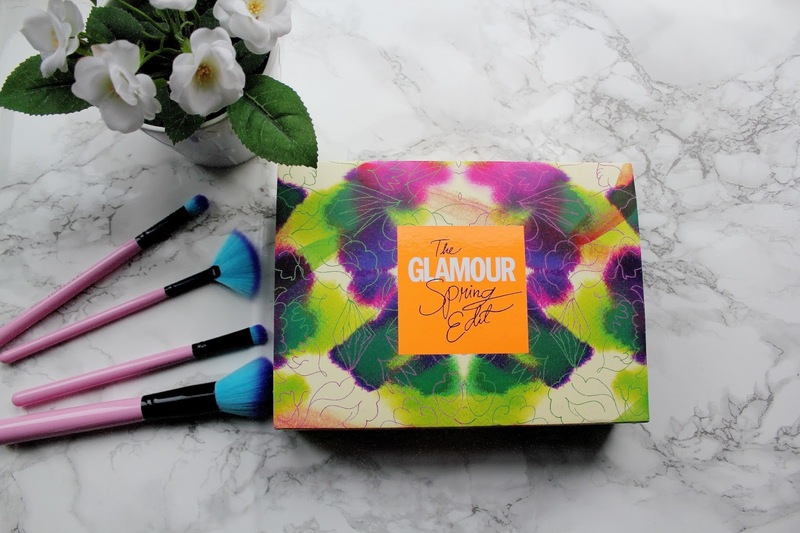 The sample shade in this box is quite neutral so I've tried it a few times but it's a little too light for me so I've kind of used it as a highlighter on top of my normal foundation to make my under eye areas look brighter. 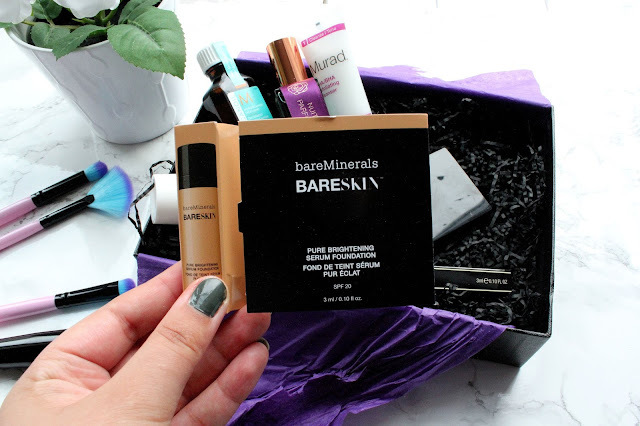 I'm definitely going to head to my local Bare minerals counter to pick up a sample in my shade. 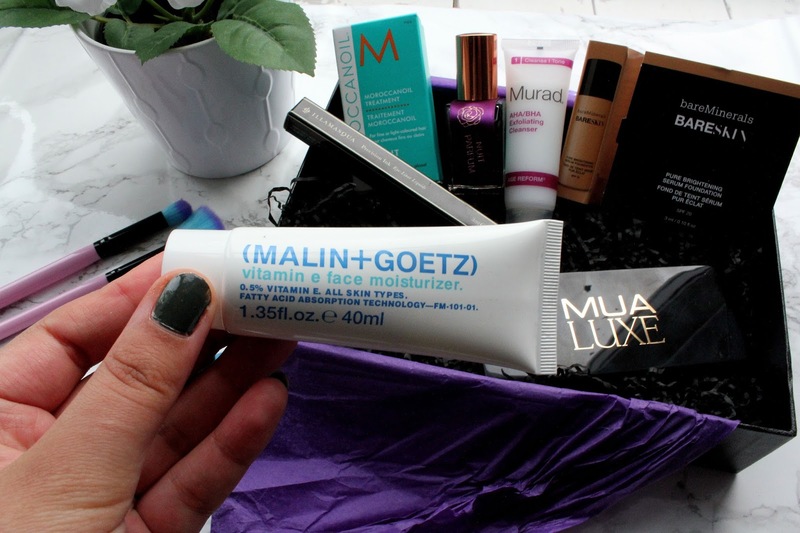 Malin + Goetz Vitamin E Face Moisturiser I've tried a few Malin + Goetz products before and absolutely loved them but I've never tried out this moisturiser before. I've used this moisturiser a few times so far instead of my normal moisturiser in my evening routine and I've been really impressed with it. I use this after cleansing and toning and this moisturiser is very cooling on my face. This leaves my skin feeling really moisturised and hydrated. 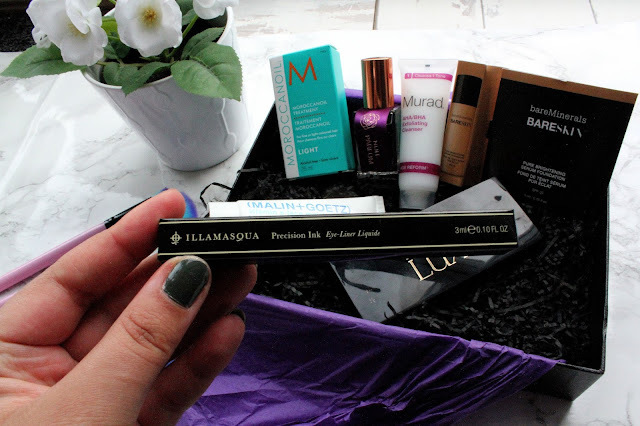 Illamasqua Precision Ink Eyeliner This product I'm a little disappointed about but I will carry on using it non the less. When I use eyeliners I prefer using them in pen form as I find it a lot less messy to use. This product is super good as it's waterproof so if you're a girl who is looking for an eyeliner that lasts all day this product is for you. 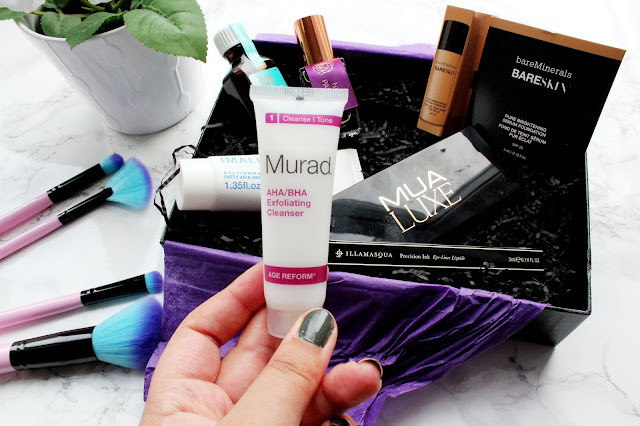 Murad is an extremely well known brand for it's amazing skincare products. 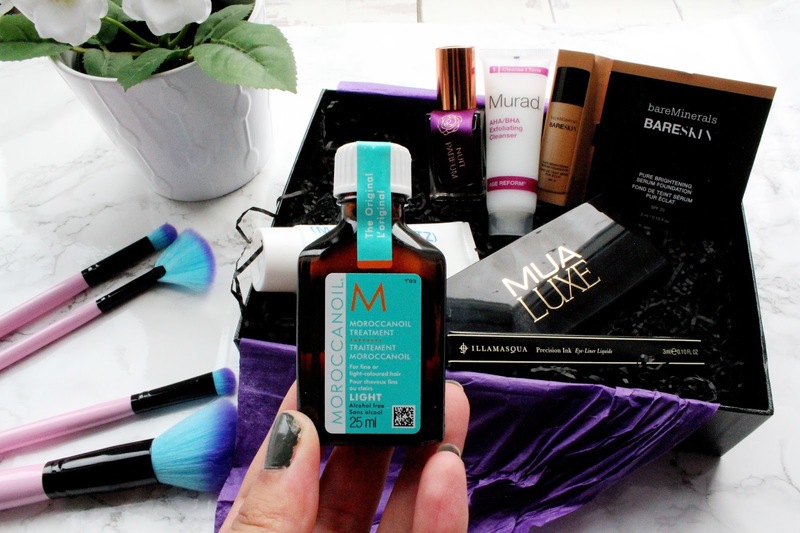 I've used this before (from a different beauty box) and I really like it. This is best used 2 to 3 times a week and this cleanser keeps your skin hydrated and cleansed and leaves your skin feeling smooth after just one use.